These Promotional Wheels are Easy to Transport! This Display is Dry Erase! 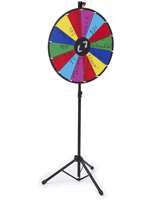 These Promotional Wheels are Great For Trade Shows! Please log in to view wish lists. This product is on overstock sale. Enjoy limited time savings! "Clicking" noise made as wheel spins adds excitement and draws in crowds. 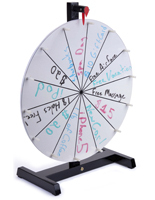 24" Diameter write-on board is easily customizable with (14) prize slots. Glossy acrylic surface really stands out and makes writing "pop" off the board. Comes with carrying case for easy transport. Also compatible with liquid chalk and wet erase markers. Wood stand has rubber footing to prevent shifting on a table when spun. Order before 3PM ET and this item will ship today. These promotional wheels work well at trade shows. 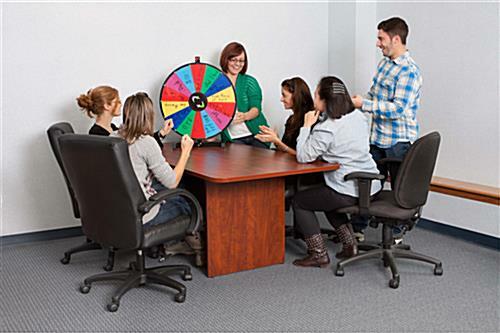 Improve morale of employees and get them excited to play this prize game. 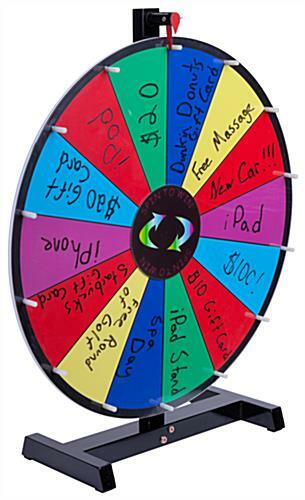 Reward hard work by giving away prizes to employees who spin these promotional wheels. This display is easy to organize different prize giveaways with the different color slots located on the board. 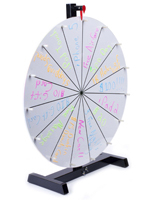 These promotional wheels that are dry erase make it simple to rewrite new items on each of the prize slots. These promotional wheels that are for trade shows can be transported easily from city to city. With this product it is easy to draw the attention of potential clients. 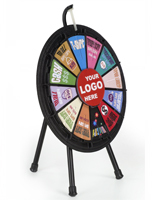 These countertop promotional wheels have a high quality glossy finish that can catch people's eyes from across the room. 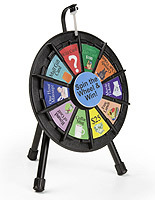 Everyone involved will have fun when playing this prize game. 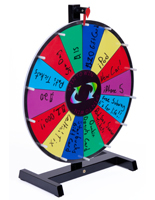 These promotional wheels that are acrylic are affordable and some of the lowest prices available. This product is a great value and will be sure to increase any business's marketing potential. 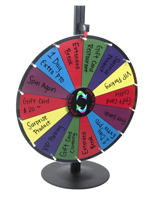 Don't miss your opportunity to purchase one of these promotional wheels today. Please Note: The acrylic surface is compatible with both wet-erase and dry-erase markers. 18.0" x 27.5" x 20.0"
Order by 3PM Eastern Time US for same day shipping. Browse reviews from customers who have already purchased this product. This product has not been reviewed yet. Be the first. WARNING: This product can expose you to Ethyl Acrylate, which is known to the State of California to cause Cancer. For more information go to www.p65warnings.ca.gov. We are committed to connecting with the world in environmentally and ethically responsible ways. Join our email list to receive deals and coupons.